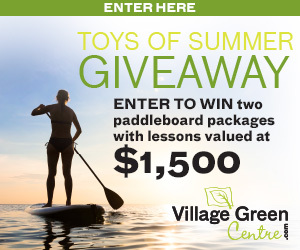 Enter to Win the “Toys of Summer” contest. QUALIFIED ENTRANT. Contest is open to all residents of British Columbia. forfeited. Facsimiles, copies or entries received by mail will be disqualified. date and time as posted by the Contest Producers. from Kalavida Surf Shop. Approximate retail value is $1,500.00. and prize will become the property of the Contest Producers. expressed or implied, oral or written, in respect to any prize.